Innocence until proven guilty is one of the cornerstones of the criminal justice systems of the developed world. The courtroom has been used for centuries as a generally agreeable alternative to mob hangings and street stonings and I think we'd all agree that it's largely a successful system. But there's a new kind of courtroom in the 21st century, and with it comes a new kind of justice – the social kind. Born out of the interconnected global sphere of Twitter and the video evidence locker that is YouTube, social justice is regularly dealt out by outraged masses embroiled in feverish outbreaks of righteous indignation. And nowhere is this better exemplified than in small communities where social media can make enough of a splash to actually make a difference. Take the city of Bath, in south west England as an example. Home to around 85,000 people, it's the base of TechRadar's publishing company and has recently been the location for four diverse cases of social justice served out through the power of YouTube and Twitter. The video was posted to YouTube earlier today, and went straight to the top of Reddit. Thousands of views and retweets later, a matter of hours had passed before the aggressive busker in the video had been named, tracked down by the local paper and forced to apologise. He even makes a good stab at justifying his awful behaviour. Nice try, angry busker man. As commenter lgaddy points out, the discussion was led by Felix Renicks who runs the popular @WeLoveBath twitter account, followed by over 16,000 people. This account has been at the epicenter of local discussions in the last couple of years and continues to grow as a knowledge resource. So is that justice done? You'd have to say yes, wouldn't you? This isn't the only recent case of Twitter and YouTube combining in this way. And in a strange coincidence, both of the other recent cases in Bath were filmed on the same street corner. Similar to the case above, this unbelievable couple came to the attention of the court of Twitter, which immediately found them guilty of being bad people and sentenced them to an undignified naming and shaming as well as some (unnecessary) abusive phone calls to their business. Once again, a video was posted on YouTube, it went viral, and the power of social brought this to the attention of the authorities. The window cleaner himself was also fined £2,000 for crimes against health and safety. Many would argue that Twitter's flavour of social justice can easily spill into the realms of retribution and punishment and that's where things get tricky and uncomfortable. Anonymous internet abuse is a horrible thing and shouldn't be confused with general outcry over a specific issue. But the fact is that while the social judgement of the masses on Twitter is in its unregulated infancy, it works because people only seem to call outcry when it's deserved. 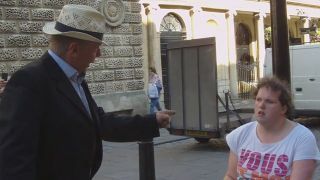 Take another recent YouTube sensation in Bath as an example of this - the curious case of the Bath Seagull man. Seagulls are a major pest in Bath, and a little old man was last month confronted by a person with a video camera when he was spotted feeding them huge amounts of bread. But instead of people going nuts, criticising the old man, the citizens of Bath rallied to this defence. They defended his right to feed birds, recognising he'd done nothing to deserve being aggressively confronted by a stranger and exposed on YouTube. The reactionary news story on the local newspaper website was subsequently edited, the link to the video removed. And the video itself was eventually deleted from YouTube by the user (it's still up on Facebook) as a result of public pressure. How's that for justice done?